Casey Corr: So who were the top 10 liars in Seattle sports history? So who were the top 10 liars in Seattle sports history? 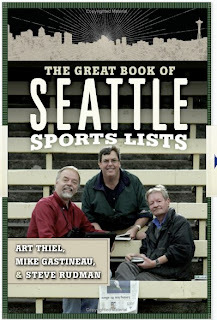 Those and many other questions are answered in The Great Book of Seattle Sports List by Mike Gastineau, Art Thiel and Steve Rudman. Tonight's book party ran contrary to the standard cuisine of sports writers. Instead of beer and hot dogs, it was wine and cheese. Will success spoil them?